The mission of the Kumu Kahi Department is to enrich and enhance the lives of Native Hawaiian elders by preserving and restoring their health, sense of dignity, self-respect and cultural identity and promote lifelong learning. Ke Ola Pono No Nā Kūpuna Program (Good Health and Living for the Elderly) is funded through the Older Americans Act, Title VI, Part B, Grants for Native Hawaiians. 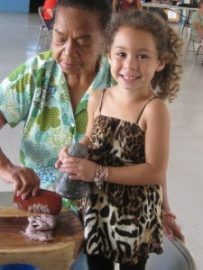 The program provides nutritional and supportive services for Native Hawaiian elderly age 60 and older. The Native American Caregivers Support Program is funded through the Older Americans Act, Title VI, Part C, grants for Native American Caregiver Support. The program provides services to caregivers of Native Hawaiians age 60 and older.